333 Commercial Street #3 is a one bedroom one bath condo right on the beach! It has 552 square feet and is being marketed for $895K. MLS REMARKS: The hottest waterfront property in P-Town. Rarely available with breathtaking water views! 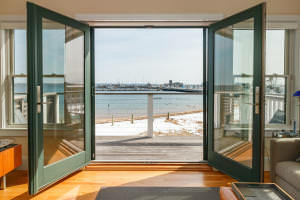 Have you ever wished to watch both the Provincetown sunrise and sunsets from your private deck? Nestled on the beach-side of Commercial Street and tucked away near the water, you will find this one-of-a-kind one bedroom Cape condo! With absolutely gorgeous and unobstructed views of McMillan Pier and the Provincetown Harbor this unit is sure to be the condo you have always dreamed about owning! Stunning wood floors throughout and beautiful windows and doors enhance the experience this unit offers! Perfectly located in the center of Provincetown you have perfect views of the Pilgrim Monument from your bedroom! This unit has never been rented and is in impeccable condition. Listing courtesy of Robert Paul Proerties. See all available proertoes for sale at Beachfront-Realty.com.